Summary: We describe MR changes that occurred 3 and 6 weeks after a suicide attempt with cyanide. 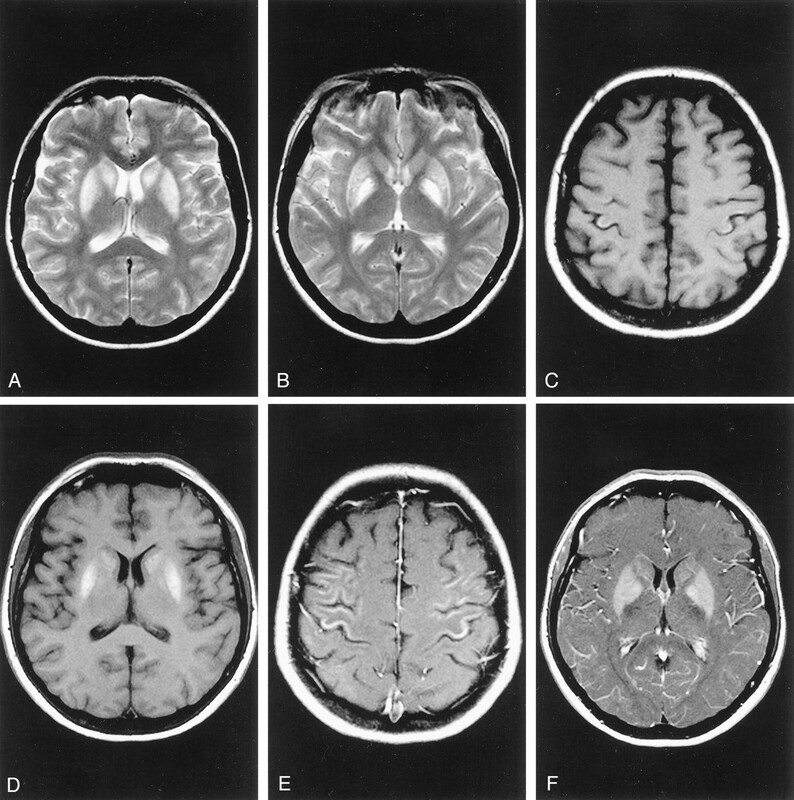 The toxicity of cyanide causes damage, primarily to the basal ganglia, and those changes were visible as altered signal intensity on the first MR images. Extensive areas of hemorrhagic necrosis were seen 6 weeks later. Our case shows pseudolaminar necrosis along the central cerebral cortex 3 weeks after cyanide poisoning, showing that the sensorimotor cortex is also a site for toxic necrosis because of its high oxygen dependency. Acute cyanide poisoning is usually the result of attempted suicide, which, because of the high doses, is often lethal within minutes or leads to a very poor prognosis after delayed and inadequate treatment. The primary long-term neurologic consequence is pseudoparkinsonism with extrapyramidal symptoms. The toxicity of cyanide is based on the inactivation of cytochrome oxidase, a terminal enzyme in the cellular respiration chain. Thus, acute cyanide poisoning affects the cerebral structures with the highest oxygen requirement, such as the basal ganglia, the cerebral cortex, and the sensorimotor cortex (1). As a result, the anoxic encephalopathy shows hemorrhagic necrosis, mainly in the striatum, and pseudolaminar necrosis in the cortex. A 35-year-old female laboratory assistant took an unknown quantity of cyanide with suicidal intent. Ten minutes later, she was found in a comatose condition with stable cardiovascular function and was immediately given emergency treatment in an intensive care unit. Under controlled respiration, antidote therapy was instigated with dimethyl aminophenol and sodium thiosulphate, which resulted in a linkage with cyanide, and anti-edema treatment was administered. After withdrawing the sedatives and removing the patient from the respirator, the patient exhibited pronounced agitation and a picture of akinetic mutism. The spontaneous motor symptoms resolved completely, and the upper extremities showed choreathetotic movement patterns in response to external stimulation. Against parkinsonism, a dopamine agonist (amantadine sulfate) was initially IV administered and was later replaced by orally administered medication. The treatment was centered on intensive physio-, logo-, and ergotherapy. During the 4-week period of hospitalization, the clinical picture improved considerably. The patient could eat, communicate within limits, and walk short distances with aid. The patient was then transferred to a rehabilitation center for further therapy. Three weeks after her attempted suicide, only the fluid-attenuated inverse recovery image showed discrete bilaterally hyperintense alterations high in the frontoparietal region. These exhibited marked contrast enhancement. The changes were consistent with a picture of pseudolaminar necrosis along the sensorimotor cortex. On the unenhanced images, the basal ganglia appeared hardly changed. Only the T2-weighted and fluid-attenuated inversion recovery images showed discrete areas with hyperintensity in the lentiform nuclei and the caudate nuclei bilaterally. However, after administering contrast agent, enhancement again occurred. Six weeks after the acute cyanide poisoning, areas of hemorrhagic necrosis with hyperintense signal changes could be seen on the T2-weighted and fluid-attenuated inversion recovery images in the region of the striatum and the globus pallidus. The unenhanced T1-weighted studies also showed hyperintense signal in the basal ganglia and linear changes along the sensorimotor cortex, consistent with hemorrhage. Cyanide poisoning can occur by inhalation, ingestion, or dermal absorption. Chronic intoxication occurs with occupational exposure (metal industry, mining, jewelry manufacture, inhaling smoke). The results usually present as ataxia and optic neuropathies. Acute cyanide intoxication is most often the result of attempted suicide, and the mortality rate is 95% because of the high doses taken. The mean lethal dose for oral ingestion of potassium cyanide is 250 mg, or 3 mg/kg of body weight (2); however, there is a certain individual range of resistance to the toxin, because higher doses are tolerated, particularly in anacidity (eg, chronic gastric disorders) (3). Cyanide blocks the trivalent iron in the cellular respiration enzymes. The respiration chain is blocked at the level of cytochrome oxidase (cytochrome aa3), a terminal enzyme of the respiratory electron transport chain. Thus, the oxygen released by oxyhemoglobin cleavage can no longer be bound. This blocks cell respiration and leads to respiratory arrest within a few minutes (4). In addition to cyanide, carbon monoxide and manganese are also considered to be respiratory toxins. Manganese accumulates in mitochondria, and carbon monoxide binds to cytochrome and hemoglobin. These toxins lead to structural damage and parkinsonism by the same mechanism as that of cyanide (5, 6). Cyanide exhibits a particular affinity for structures with a high oxygen requirement and therefore leads to hemorrhagic necrosis, especially in the basal ganglia. Because of their high degree of oxygen dependency, however, the cerebellar and sensorimotor cortex can also be affected. In this case, the damage is attributable to the direct toxic action and is not the result of cerebral hypoxia as part of the acute intoxication process. Although the hippocampus is a highly oxygen-dependent structure, it is spared in all the cases cited in the literature (5, 6–10). In their experiments on experimental cyanide encephalopathy, Levine and Stypulkowski (11) stated that the hippocampus is less affected than the striatum as a site of injury. In our case, the MR imaging studies performed 3 weeks after the attempted suicide showed marked structural damage in the region of the basal ganglia (Fig 1). 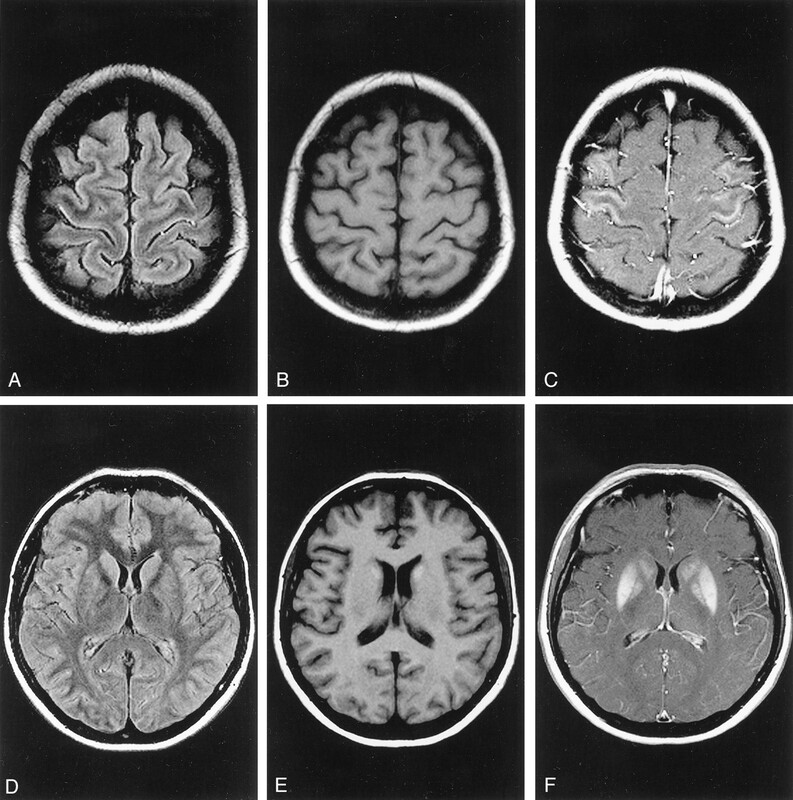 The second follow-up MR imaging examination, performed 6 weeks after the acute intoxication, showed hemorrhagic necrosis in the striatum and globus pallidus (Fig 2). These MR changes have also been shown in the few cases described to date in the literature (5, 7–10). The earliest MR imaging studies quoted in the case reports published to date were performed 2 weeks after acute cyanide poisoning. These also described changes in the region of the basal ganglia similar to those described in the article by Rosenow et al (7). Follow-up MR images obtained 3 weeks after cyanide poisoning. A, Fluid-attenuated inversion recovery (9000/110 [TR/TE]) image. Discrete hyperintense linear signals can be seen along the sensorimotor cortex. B, T1-weighted (550/14) image obtained before the administration of contrast agent. C, T1-weighted (715/17) image obtained after the administration of contrast agent. Massive contrast enhancement can be seen along the central region, consistent with pseudolaminar necrosis. D, Fluid-attenuated inversion recovery (9000/110) image. Discrete hyperintense signals can be seen in the caudate nuclei bilaterally. E, Unenhanced T1-weighted (550/14) image shows hyperintense signals in the caudate nuclei bilaterally, consistent with hemorrhage. F, T1-weighted (715/17) image obtained after administration of contrast agent. Massive contrast enhancement can be seen in the lentiform nuclei and the caudate nuclei bilaterally. Follow-up MR images obtained 6 weeks after cyanide poisoning. A and B, T2-weighted (2660/90) images. The hyperintense signal changes in the basal ganglia are considerably more pronounced. C and D, T1-weighted (550/14) unenhanced images. Hemorrhagic necrosis can be seen in the sensorimotor cortex (C) and the basal ganglia (D). E and F, T1-weighted (715/17) images obtained after administration of contrast agent. Pronounced contrast enhancement can be seen along the central cortex (E) and the basal ganglia (F). Rosenberg et al (8) described one case in which the MR images showed no abnormal changes 6 months after acute cyanide poisoning. Only 12 months later did a further follow-up MR imaging examination show the typical bilateral basal ganglia lesions described above. We have shown both hemorrhagic basal ganglia necrosis and similar signal intensity changes along the cerebral cortex after acute cyanide poisoning. Because the sensorimotor cortex is another oxygen-dependent and cyanide-sensitive structure, direct toxin effects cause so-called pseudolaminar necrosis. This is a further typical change seen on MR images after acute cyanide poisoning. In the rare case that a patient survives acute cyanide intoxication because of immediate and effective intensive care, diagnostic imaging should be performed as soon as possible. MR imaging is the method of choice for depicting the extent and structure of lesions in the cyanide-sensitive regions of the brain. The MR finding of pseudolaminar necrosis along the cerebral cortex, which to our knowledge has not been previously reported, as well as hemorrhagic necrosis in the basal ganglia, are typical following acute cyanide intoxication. Accepted after revision April 9, 2002.